Last time, the first rays of the sun heralding the end of winter had done it for him. From a handsome snowman adored by the neighborhood children, he had been reduced to slush, trampled on by practically everyone. One nasty kid had even kicked his hat away! It was at that point he had made up his mind that next time he’d run away to North Pole where that spoil sport sun would never be able to melt him. And that’s exactly what he did this time. The moment people started building him, our little hero started working on his master plan. First, he focused on figuring out where he could find a pair of snow boots. That one was easy—out on the patio of that yellow house. It was a slightly old pair, but it would get the job done. His next move was to wait patiently until everyone went indoors and retired for the night. This one was certainly not easy. Waiting, waiting, waiting. Even snowmen get bored, you know! After the last kid went indoors, our brave snowman slowly inched towards the yellow house, grabbed the boots from the patio, and off he went—to boldly go where no snowman had gone before. To the North Pole! Finally after days of walking (and minimal adventure), he reached the North Pole where he told all the snow folks the story of his great escape. Mesmerized by his tales of adventure (apparently it doesn’t take much to impress the snow people), the snow folks unanimously decided to make him the head of their North Pole Decoration Committee. Their reasoning for offering him this position: he was the only one among them who had seen how people around the world decorated their homes for Christmas, which made him the best snowman for the job! Of course, there was that red-nosed fellow named Rudolf who had probably seen more over the years during his annual jaunts with jolly old Nick, but the poor fellow’s area of expertise laid more towards taking off the decorations (albeit unknowingly) with his antlers than putting them up for display. This practically ruined any chances of Rudolf ever being offered a membership to this hallowed committee. But I digress. As I was saying, for the first time in his several lifetimes, our little snowman was truly happy. And he was home, among his own kind! The end of Christmas would also no longer mean the end of him, thanks to his presence of mind and a pair of muddy old boots. So there is our runaway snowman, showing other snow folks how to make little Christmassy banners to hang all over the North Pole. And going by the looks of it, he seems to be doing a mighty fine job. This little fella is certainly going to add some Christmassy cheer to my place. 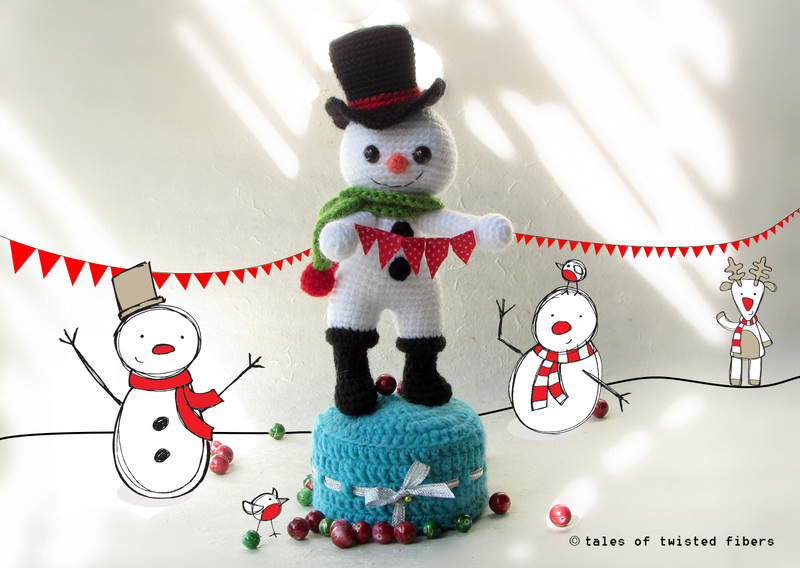 If you love cute little amigurumi snowmen and cheerful banners, you can download this free pattern and make one for yourself. For the DUTCH version of the pattern, translated by our fellow crocheter Nanske, click here. I hope you will enjoy this pattern as much you’ve loved all my other amigurumis. 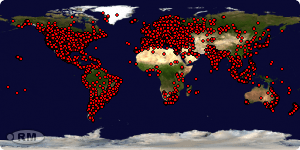 Wish you a Merry Christmas and an amazing New Year! Thank you sooooo much for all your patterns 🙂 I love, love, love them!!! I search the pattern of doctor mcstuffins, would be to come true to it please? Snowman is such a doll! 😀 Love the way you made him look, so happy! Thank you Serah for another great pattern! This is so adorable. 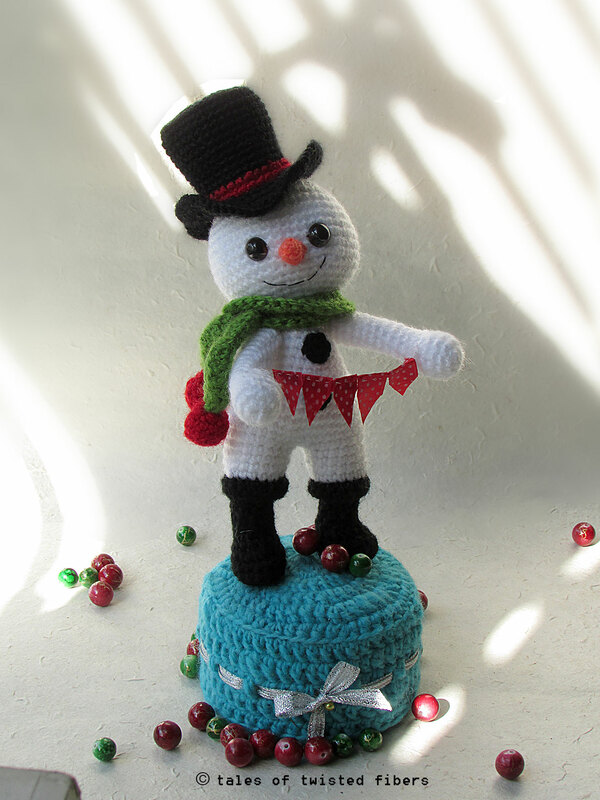 Going to make one for my friend who loves Snowmen!! Thank you so very much for sharing this!!!! gracias lo voy a hacer para mi hija. Hi there! I love your pattern, but I’m not sure how to download it. Any help? !